The Board of Trustees voted to approve the budget for the next fiscal year on Friday. Nelson Carbonell, the chairman of the Board of Trustees, said the budget was crafted to make the University more affordable for students. The Board of Trustees voted Friday to approve the University’s budget for next fiscal year, investing less in major construction projects and funneling more money toward academic projects. Next year’s total operating budget will top $1 billion for the second consecutive year. The Board also approved a reduced capital budget for the second consecutive year, awarding less money for construction and renovation projects as the University wraps up major building ventures. 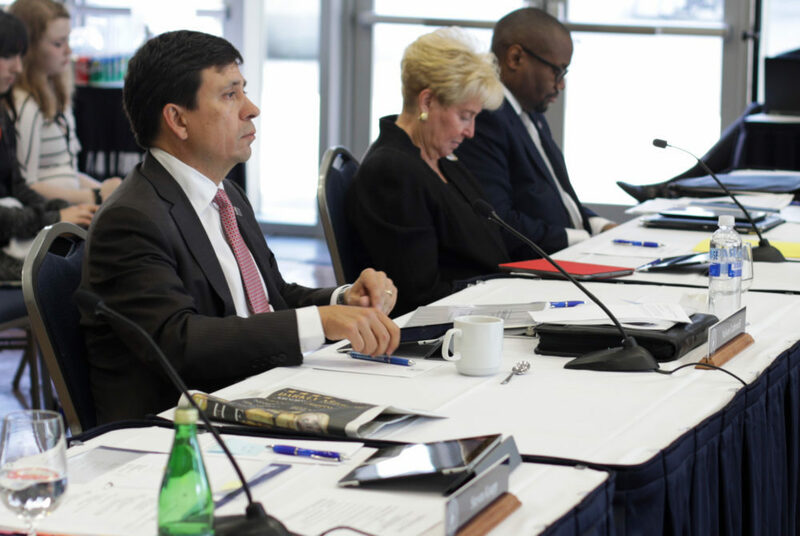 Nelson Carbonell, the chairman of the Board of Trustees, said the budget was crafted to make the University more affordable for students – approving the largest increase in financial aid in recent years – and to keep GW competitive with its peers in the quality of its academics and facilities. “The other side of it is really about maintaining the quality and caliber of the institution, which means that we have to be competitive, for our students and faculty, in terms of pay and benefits and the kinds of facilities that they work in, the kind of support that they have,” he said. The Board approved a roughly $67 million capital budget for next fiscal year, University spokeswoman Candace Smith said. The capital budget decreased by about 27 percent from last year’s $85.3 million and declined substantially from 2012 to 2014 when the capital budget totaled more than $400 million. Smith said the budget fell because major construction projects, like the Science and Engineering Hall and District House, funded through the capital budget, are now complete. The approved capital budget includes $3.2 million to build a nurse practitioner simulation lab and an instructional design and media center for the nursing school on the Virginia Science and Technology Campus, Smith said. The School of Medicine and Health Sciences will receive $3.9 million to renovate labs and classrooms. The money for these renovations will be spent in fiscal year 2018, she said. Julia Cruz, a clinical instructor of medicine in SMHS, said changes in technology in the last five years require renovations to keep the school’s facilities competitive and up-to-date. “Especially now that so much of the technical information can be shared with folks through any kind of different ways, even videos on YouTube,” she said. Next year’s budget also includes renovations for Fulbright, Jacqueline Bouvier Kennedy Onassis and Francis Scott Key halls, officials said in a release Friday. The University plans to renovate four other buildings this summer. Typically, the University allocates about $6 million for summer renovations. The total operating budget will be $1,049,965,000, dedicated to academic projects including more funding for online learning and for the science, technology, engineering and math lab that opened this semester in Gelman library, Smith said. She said the budget will be funded in part by the University’s ongoing effort to reduce the amount of space it leases in the District. Officials are ending the University’s lease in the 2020 K St. building this summer. Provost Forrest Maltzman said funding for academic projects would be a major focus of the operating budget through initiatives like the STEMworks lab, designed to provide a tutoring and work space for STEM students, scheduled to be fully operational in Gelman Library next fall. Smith said there will be a $4.4 million increase in purchased services to support the University’s growing online enrollment. Officials announced at a Faculty Senate meeting earlier this month that more than 5,000 students are now enrolled in online courses. The University expanded its online programs over the past several years by offering more than 100 certificates and bachelor’s and master’s degrees ranging from public health to business. This year the College of Professional Studies raked in more than half its revenue from online courses. Teresa Costantinidis, chief financial officer at the University of California, San Francisco, said beefing up online programs is a common trend across universities and can save students and the University money because the resources for an online course cost less compared to a face-to-face course. Costantinidis said universities use budgets as overall indicators of what officials want to prioritize in the coming year.